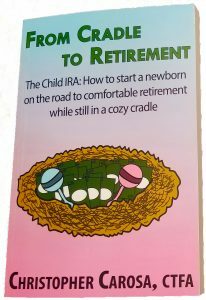 In From Cradle to Retirement, Award-winning writer Christopher Carosa expertly pieces together these thoughts and interviews to reveal a practical “How-to” guide for parents, grandparents, and their financial advisers seeking to help young children reap the benefits of the Child IRA. Within this hands-on guide, Carosa weaves the fascinating history the cultural views of retirement in America and the implications these have had on public policy. Finally, and perhaps of greatest interest, Carosa reveals real-world case-studies of people who have created actual Child IRAs for their children. Still more case-studies show how parents have attempted to duplicate some of the Child IRA’s features with other savings vehicles.